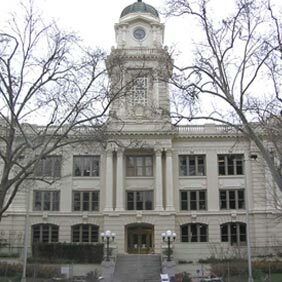 The City of Sacramento engaged the services of Aircon Energy for the lighting retrofit of 80 city buildings, 10 of which also required mechanical retrofits. This performance contract project earned Aircon Energy the Efficient Building Award, one of two awards Aircon received from Energy Users News, which recognizes the top 30 energy conservation projects in the country. When the project was completed, it was the largest lighting project ever undertaken for Sacramento Municipal Utility District. Add to that magnitude, a three-month deadline imposed on Aircon that even SMUD believed was unrealistic, yet necessary in order to acquire the rebate for the city that was only available until the end of the year. Among the buildings included in the project were the Convention Center and City Hall (above). Complete insulation of City Hall was required, while the Martin Luther King Library required conversion from a multi-zone air handling system to a high efficiency variable air volume system. In addition, direct digital control automation systems were installed to control and maintain the efficient operation of all systems. Lighting retrofits, the primary focus of the project, involved the installation of high efficiency ballasts, T8 lamps and compact fluorescent lighting.